WASHINGTON, June 19, 2017 /PRNewswire-USNewswire/ -- States that expanded Medicaid coverage under the Affordable Care Act (the ACA) saw 2.5 emergency department visits more per 1,000 people after 2014, while the share of emergency department visits by the uninsured decreased by 5.3 percent. The results of a study of 25 states will be published online Monday in Annals of Emergency Medicine, along with an accompanying editorial ("Impact of the ACA Medicaid Expansion on Emergency Department Visits: Evidence from State-Level Emergency Department Databases" and "The Uncertain Economics of Insurance Enabling More ED Visits"). "Medicaid expansion had a larger impact on the health care system in places where more people were expected to gain coverage," said lead study author Sayeh Nikpay, PhD, MPH, of Vanderbilt University in Nashville, Tenn. "The change in total visits was twice as large in a state like Kentucky, where most childless adults were ineligible for Medicaid at any income level before 2014, as in states like Hawaii, where childless adults were already eligible for Medicaid above the poverty line." The study, which analyzed patient visits in 25 states (14 states that expanded Medicaid coverage and 11 that did not), found that the share of visits covered by private insurance remained constant for expansion states and increased by several percentage points for non-expansion states. Gains in insurance coverage in non-expansion states were almost entirely in the form of private coverage, not Medicaid. Among the visit types that could be measured, increases in emergency department visits were largest for injury-related visits. There was also a large change in payer mix for dental visits, likely because dental emergency department visits are most prevalent among low-income, non-elderly adults, who would be covered by Medicaid. Out-of-pocket dental costs were reported as one of the more unaffordable types of care among the target population for Medicaid expansion under the ACA. Ari Friedman, MD, PhD, of Beth Israel Deaconess Medical Center in Boston, Mass., who wrote the accompanying editorial, said: "More emergency department visits by Medicaid beneficiaries is neither clearly bad nor clearly good. 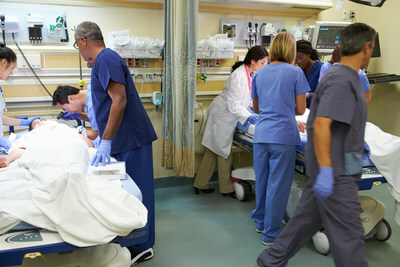 Insurance increases access to care, including emergency department care. We need to move beyond the value judgments that have dominated so much study of emergency department utilization towards a more rational basis for how we structure unscheduled visits in the health system. If we want to meet patients' care needs as patients themselves define them, the emergency department has a key role to play in a flexible system."